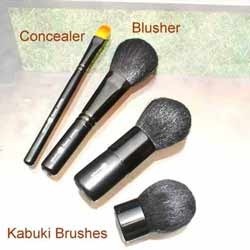 Fine quality brush most suitable for bleach and face pack. This versatile double-ended brush is ideal for creating different eyeshadow effects. Use the full, rounded end to swoosh on shadow easily. Use the long-bristled end to soften shade transitions. Materials: Pony Hair, Aluminium, Wood. Direction of Use: Tap brush to remove excess colour. Lightly blend on apple of cheeks, hairline and chin. This is BnD classic collection ultra soft bristle brush, majority used for dusting excess powder or shadow fallen on the face without damaging the face foundation. - Background : It is a water-proof, volume-building mascara that protects your eyelashes and makes it appear intriguingly fuller. It comes along with a unique brush so that smaller and thinner eyelashes are not left out. Classic Eye Makeup Brushes brush helps to blend eye shadow shades. 24 piece makeup brush set. Having 24 diffrent kinds of brushes, serving all purpose.